From end-of-month July to end-of-month August, the MIAC Generic Servicing Assets, (GSAs™) Conv_30 Index decreased by 0.86% and the GNII_FHA_30 index decreased by 1.62%. In larger GSA cohorts, which are actively traded in the MSR market, the Conv30_3.5_2016 and GNII_FHA30_3.5_2016 cohorts respectively decreased by 1.45% and 1.47%. During the month of August, Conv_30 Index OAS’s remained virtually flat at 607.9 bps and GNII_FHA_30 Index OAS’s widened to 727.3 bps for a month-over-month increase of 13.3 bps. Year-to-date Conv_30 Index OAS’s are tighter by a full 188.1 bps and GNII_FHA_30 Index OAS’s are tighter by an impressive 266.7 bps. From end-of-month July to end-of-month August, primary rates as reported by Bankrate® decreased by two (2) basis points. Any concern over the slight decline in MSR values caused by the minor decline in August rates will be nothing more than an afterthought since through the first 25 days of September Conventional 30 Primary rates are already higher by an impressive twenty-three (23) basis points. At the time of print, this month’s back-up means that year-to-date 30-Yr conventional primary rates are now higher by a full seventy-nine (79) basis points. The September back-up means that rates are now in close proximity to the MBA’s recently updated end-of-year 30-Year Fixed Rate Mortgage Rate projection of 4.70%. When accounting for MSRs’ “fair value” compliance with the FASB’s ASC 820 standard is the objective. However, MSR market values can be slightly different than the GAAP “fair value” measurement. The intention of a GAAP “fair value” measure is to quantify the value of a financial instrument. A financial instrument has value to the holder of the asset and the holder is not required to perform any service to collect this value. The current holder of a financial instrument can realize this value or transfer the value to another party. The new holder of the financial instrument can obtain this value without materially changing their performance from the original holder. However, MSRs are a hybrid financial instrument. The holder of an MSR asset must perform a service to collect the value of the MSR Asset. Those cash flow components of an MSR asset that are subject to high variability, when transferred to a new servicer, are not considered in the fair value measurement. But these cash flows are real and are often included in market values. So the question for fair value measurement is which component cash flows are very institution-specific and which can be transferred to another servicer without a material change in the anticipated behavior. What about voluntary prepayments? Most mortgage industry participants realize that the decision and actions of the borrowers to voluntary prepay are largely outside the control of the servicer. However, historical voluntary prepay speeds for a distinct population of borrowers and geography may vary from the national “average” population. It is therefore defensible for a fair value measurement to slightly adjust national consensus voluntary prepayment expectations to account for the unique population of borrowers and the loan attributes distinct from the larger national populations. The degree to which the particular portfolios are expected to vary from the national population is subject to opinion, but these adjustments would impact both the fair value and the market value of the MSRs. What about delinquency and foreclosure rates? These forecasted behaviors are considered to be less susceptible to actuarial behavior and are specific to the loan attributes. Both are distinct by population but there is considerable evidence that at the margin, the delinquency and FCL rates can be adjusted based upon the operational performance of the servicer. However, the change in the present value of MSR assets with modest adjustments in delinquency and FCL behaviors is actually very modest. What about retention programs or early buy-out (EBO) programs? These cash flows are considered to be materially distinct from one servicer to the next. The Servicers need to execute operational programs to obtain these incremental cash flows and the level of operational performance can vary significantly. Therefore, under ASC 820, GAAP would exclude these cash flows. What about the costs associated with servicing a loan? Here the thinking is that the current holder of an MSR asset can measure their realized and expected costs to service the loans available to their valuation assumption. However, for fair value considerations, the current holder should estimate what the most likely buyer’s cost expectations will be. Generally, the assumption is that a low-cost Servicer will be the most likely winner of an auction and therefore utilize aggressive servicing cost assumptions for their MSR fair value measurements. These aggressive cost assumptions are not specific to the current holder of the MSRs and both the fair value and market value measurements are likely to use similar and aggressive (low) cost assumptions. Because MIAC’s GSAs have very transparent loan attributes and the institution-specific component cash flows that are excluded from a fair value calculation, the GSA market value pricing can be used to defend a fair value measurement. 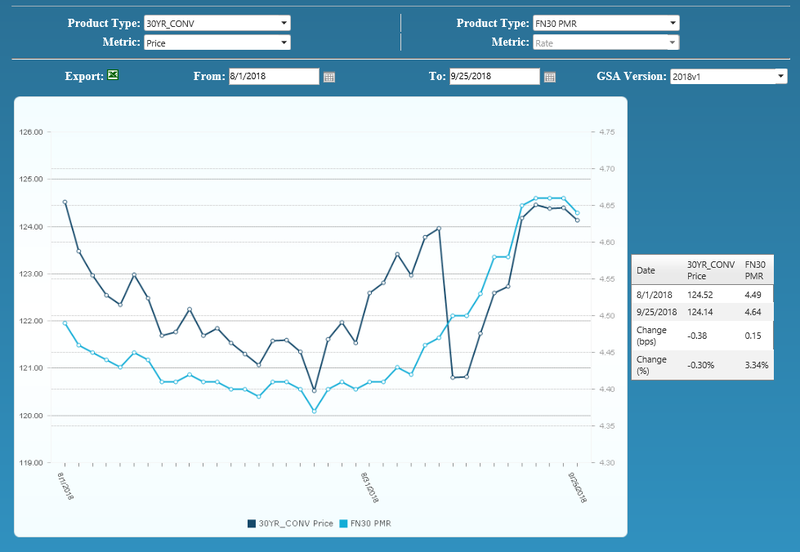 GSAs track fair value at a granular level and the underlying loan attributes are fully transparent, MIAC can utilize bulk package transaction pricing information to better inform MIAC’s price discovery process. Given the current number of observed trades and depending on one’s MSR portfolio, MIAC has a considerable amount observed empirical pricing data to validate and defend our MSR fair values. Mortgage firms not already leveraging MIAC’s GSA pricing and MIAC’s MSR price discovery process frequently discover that some or at least certain segments of their MSR portfolio have been significantly overvalued. Under ASC 820, “Fair Market” value is the price that would be received to sell an asset in an orderly transaction between market participants at the measurement date. In an orderly established market, booking a fair value level starts with market supported values and are properly adjusted for institution-specific adjustments. However, MIAC GSAs intentionally exclude the institution-specific cash flow components in the GSA characteristics. MIAC’s GSAs are regularly calibrated to observed trades and can be used as a reliable benchmark from a firm that provides MSR valuation advisory services to over 200 institutions totaling nearly $2 trillion in residential and commercial MSR valuations every month. All too often firms come to the discovery that fair value and market value are different the hard way which is through a failed auction. Don’t be one of those firms! Some MSR brokerage firms are confused about the precise distinctions between fair value and market value. These brokers are incentivized to convince the current holder of the MSRs that the market values are dramatically higher than the market will actually reflect. This bait-and-switch approach will be costly to both the reputation of the seller in the marketplace, but also force sudden write-downs of the Seller’s MSRs if the firm had previously adopted the overvaluations as the fair values. A frequent question is what can be done to improve the Ginnie Mae MSR market liquidity. The reality is that Ginnie Mae portfolios are being sold to an ever-increasing number of Servicers. The newer participants are mostly non-bank buyers so market liquidity is improving. But can the Ginnie Mae market further narrow the gap with the conventional MSR market? Ginnie Mae recourse is first to the mortgage company and subsequently to the underlying insured loan collateral. However, the VA loan insurance is limited, and this further exacerbates the magnitude of the financial loss exposure to the servicer. This additional risk is difficult to quantify and of course, requires the prospective buyer to hold more capital. However, servicers who are confident that they can perform the delinquent servicing and loss mitigation process with a high degree of proficiency can leverage this operational competence through acquisitions. Moreover, a Ginnie Mae servicer has the option to buy a delinquent loan from the MBS pool and then refinance the loan and deliver the new loan into a new MBS pool. Firms that have an operational competence in early buy-out (EBO’s) can also create significant financial gains through the acquisition of Ginnie Mae MSR portfolios. And finally, the measurement of fair value for Ginnie Mae MSR requires two additional components that are rarely found in MSR valuation technology. Firstly, the MSR pricing models need to have precise estimates of the probability of default and the anticipated loss severities on their VA loans subject to “VA no-bid” risk. MIAC’s Core loan level credit model is an industry standard for precisely quantifying these cash flows. Secondly, many of the underlying FHA or VA loans become modifications under the servicer’s loss mitigation strategy. Incorporating the loan modification behavior in the cash flow modeling is rarely found in MSR valuation models. And importantly, the ability to more precisely and accurately model the expected cash flows means that Ginnie Mae MSR buyers can identify mispriced MSRs in the market. As well as the ability to properly model losses and loan modifications are paramount when estimating fair value. Recent “large” transactions which we define as deals containing $1 to $5 plus billion in unpaid principal balance have validated our very granular GSA prices. As for smaller offerings, the price/multiple spread is narrowing. Smaller offerings, defined as $500 million to $1 billion, are increasingly becoming the target of some larger buyers who have decided they’d rather not compete at the levels currently being offered for some of the largest offerings. Whether the transaction is large or small, one certainty is that most buyers are increasingly targeting pristine portfolios from well-capitalized sellers. While each buyer has their own definition of “thinly” capitalized or otherwise “at risk” counterparties, the sellers most apt to incur a price adjustment and/or fewer bids are those firms with a net worth less than $10 million. As noteworthy, buyers are increasingly ramping up their counterparty due diligence efforts pre-bid submission as opposed to post-bid submission. While numerous buyers are still content submitting an offer based on a future “satisfactory” review of 2-3 years of audited and most recent unaudited financial statements, a handful of buyers are beginning to request financials prior to bid submission. Should the combination of net worth and a firm’s financials raise any red flags, buyers are more apt to walk away before opposed to after bid submission. The smallest packages categorized as $300 million or less in unpaid principal balance are trading at a robust pace too but at prices that “on average” range anywhere from 10 to 20 basis points lower than the bid prices obtained on larger offerings. During the month of September, the Federal Emergency Management Agency announced that federal disaster assistance has been made available to the states of North and South Carolina in the areas affected by Hurricane Florence. This comes only one month after the devastation suffered in California due to widespread wildfires. Natural disasters can cause substantial damage to both the homes and income streams of borrowers located in disaster areas so recognition and ongoing monitoring is key particularly for those firms with high concentrations of servicing in the areas recently devastated. Due to the effect natural disasters can have on borrowers, and therefore loan performance, MIAC constantly monitors and flags assets located in FEMA disaster areas. MIAC’s MSR Valuation department provides MSR valuation advisory services to over 200 institutions totaling nearly $2 trillion in residential and commercial MSR valuations every month. Learn about MIAC’s industry-leading valuation, brokerage, and/or GSA benchmarking, and please reach out to your MIAC representative for more information. Posted 28 Sep 18 in MSR Market Updates.